The talk is about Black and White marriage markets, which I’ve written about quite a bit, including when I posted the figure below, showing the extremely low number of local same-race, employed, single men per women Black women experience relative to White women — especially when they have less than a BA degree. This figure was the basis for a video we made for my book, titled “Why are there so many single Black women?” For years I’ve been supporting the strong (“Wilsonian“) case that low marriage rates for Black women are driven by the shortage of “marriageable” men — living, employed, single, free men. I promised last year that Joanna Pepin and I were working on a paper about this, and we still are. So I’ll present some of this at Princeton. Five years ago I wrote about the famous 2001 paper by Joshua Goldstein and Catherine Kenney, which made lifetime marriage predictions for cohorts through the Baby Boom, the youngest of whom were only 30 in the 1995 data the paper used. That’s gutsy, predicting lifetime marriage at age 30, so there’s no shame that they missed. They were closer for White women. They predicted that 88.6% of White women born 1960-1964 would eventually marry, and by the age 49-53 (in the 2013 American Community Survey) they were at 90.2%, with another 2.3% likely to marry by my estimates (see below). For Black women they missed by more. For the 1960-1964 cohort, they predicted only 63.8% would ever marry, but 71.3% were already married by 2013, and I’m projecting another 7.5% will marry. (I also wrote about a similar prediction, here.) If they actually get to 79%, that will be very different from the prediction. Their amazing paper has been cited another 100 times since I wrote about it in 2010, but it doesn’t look like anyone has tried to test or extend their predictions. Interestingly, Goldstein and Kenney undershot Black women’s marriage rates even though incarceration rates continued to rise after they wrote — a trend strongly implicated in the Black-White marriage disparity. This issue has increased salience today, with the release of a powerful new piece by Ta-Nehisi Coates in the Atlantic (my old job), which exposes the long reach of mass incarceration into Black families in ways that go way beyond the simple statistics about “available” men. The large ripple effects implied by his analysis — drawing from his own reporting and research by Devah Pager, Bruce Western, and Robert Sampson — suggest that any statistical model attempting to identify the impact of incarceration on family structure is likely to miss a lot of the action. That’s because people who’ve been out of prison for years are still affected by it, as are their relationships, their communities — and their children in the next generation. I should note that some readers unfamiliar with demographic analysis may find parts of what follows morbidly depressing. 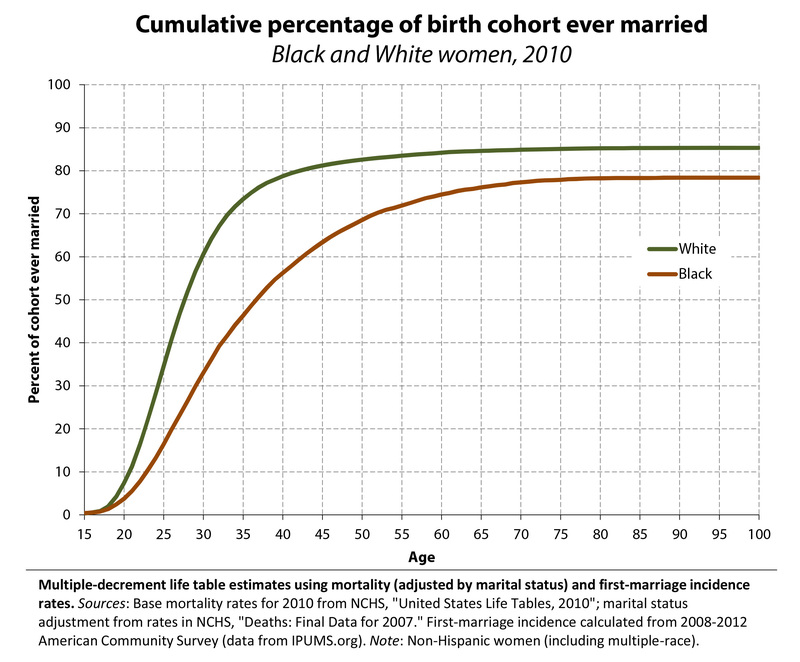 Note that my projections of 85.3% of White women and 78.4% of Black women ever marrying are lower than, for example, the roughly 96% of White women and 91% of Black that were actually ever-married at age 85+ in 2010 (reported here), for several reasons. First, I count dead people against the ever-married number (additionally, married people live longer, not necessarily because they’re married). Second, today’s 90+ year-olds mostly got married 70 years ago, when times were different; my estimates are a projection of nowadays. Specifically, although White women are twice as likely to marry in their mid-twenties, of our fictional 100,000 women stuck in 2010, just 15.6% of White women, compared with 36.8% of Black women end up marrying after age 33. The other way of looking at this — and an answer to a common question about marriage rates — is to see the chances of marrying after a given age if you haven’t married yet. 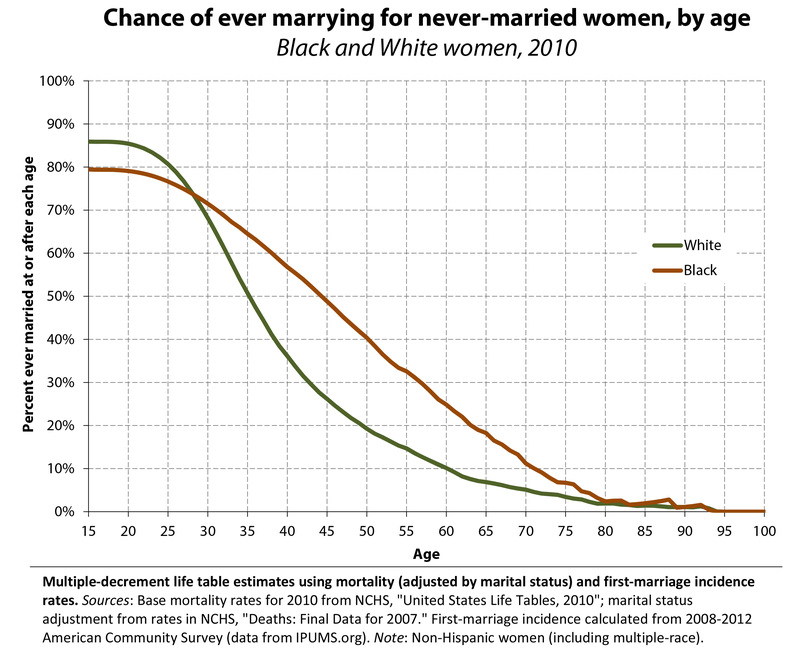 This figure shows, for example, that a White women who lives to age 45 without marrying has a 26% chance of someday marrying, compared with a whopping 49% for Black women. 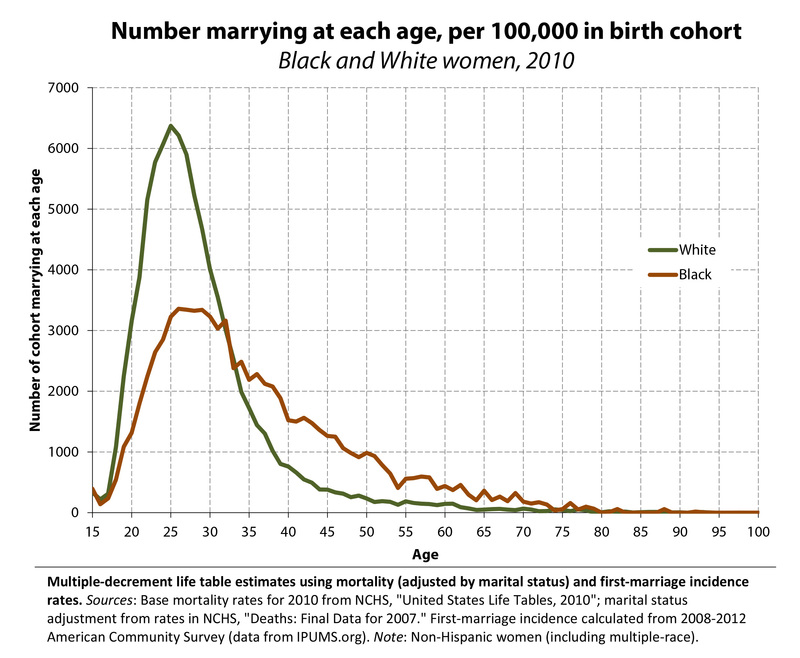 It is surprising that Black women, with lower cumulative odds of marrying at every age in the cohort, are so much more likely to marry conditional on getting to their 40s without marrying. Maybe you’ve got a better interpretation of this, but this is mine. Black women are not against marriage, and they are not ineligible for marriage in some way (even though most of these single women are already mothers**). Rather, they have not married earlier because they couldn’t find someone to marry. That’s because of all the Black men who are themselves dead, incarcerated or unemployed (or scarred by those experiences in their past) — or married to someone else. So within their respective marriage markets (which remain very segregated), the 45-year-old single White woman is much more likely to be someone that either doesn’t want to marry or can’t marry for some reason, while the 45-year-old single Black woman is more active and eligible in the marriage market. This fits with the errors in the earlier predictions, which failed to pick up on the upward shift in marriage age for Black women — marriage delayed rather than foregone. What do you think of that interpretation? If you have a better idea I’ll mention you at Princeton next week. * Technical notes: I used death rates from 2010 (found here), and marriage rates from the five-year ACS file for 2008-2012 (which has 2010 as its midpoint), from IPUMS.org. I adjusted the death rates because never-married people are more likely to die than average (I told you this was depressing). I had to use a 2007 estimate of mortality by age and marital status for that (found here), which is not that precise because it was in 10-year increments, which I didn’t bother to smooth because they didn’t have much effect anyway. The details of how to do a multiple-decrement lifetable are nicely described (with a lot of math) by Sam Preston here (though if you really want to replicate this, note one of his formulas is missing a negative sign, so plan to spend an extra few days on it). To help, I’m sharing my spreadsheet here, which has the formulas. (Note that survival in the life table doesn’t refer to being alive, it refers to being both alive and never-married.) The mortality and marriage rates are for non-Hispanic women; the never-married adjustment is for all women. For the marriage rates I used all Black and White women regardless of what other races they also specified (very few are multiple-race when you exclude Hispanics). ** In 2010, 63% of never-married Black women who lived in their households had at least own of their own children living with them. This is great, Philip. I’m really looking forward to reading the article(s) that come out of this with Joanna. Melody Boyd and I suggest that we might start using the term “marriage-free” to talk about some groups of unmarried folks as opposed to “never married” or simply “unmarried.” Similar to the way we have begun to discuss child-free women (as opposed to “childless”), this provokes new kinds of considerations. While all family decisions are structured, it could be that white women unmarried into their 40’s are simply more likely to be marriage-free than marriage-less. It’s not anything that challenges your interpretation. But it might be a bit of language that helps explain the pattern. Thanks for the post. I hope the presentation goes well. Wish I could be there. Sure. We’re tentative with our use as well (for similar reasons). And I guess “never married” doesn’t have to be stigmatizing. Nor does it necessarily suggest that someone will (or should) eventually marry. But I do sort of like the idea of trying to delve into the “never married’s” and the different reasons people delay marriage that do eventually marry as well. I agree. Good questions. One of those cases where people’s “preferences” are determined to an unknown extent by their (unequal) opportunities. So an abstract survey question isn’t going to capture it well. You could play around with Sterns’ (1981) typology, which highlights the extend to which being single may be freely chosen or unintentional as well as enduring or short term. 1. Voluntary temporary singles are mostly younger never-married adults and divorced people who are postponing marriage/partnership and remarriage/repartnership. They’re open to marriage, but searching for a mate has a lower priority than do other activities, such as career, education, or self-development. 2. Voluntary stable singles are people who want to be single and want to be so for a long time (maybe for life). This group includes people who have never-married, divorced and widowed people who do not want to remarry/repartner, and those whose lifestyles preclude marriage/relationships, such as priests and nuns. Most have the financial resources to support themselves. 3. Involuntary temporary singles are people who are actively seeking a mate but are unable to find a suitable one. The desire among this group is to be married/partnered, but for a variety of reasons marriage is delayed. 4. Finally, involuntary stable singles are primarily older divorced, widowed, or never-married people who want to marry/partner or remarry/repartner but did not find a mate and now accept their single status. This group also includes singles with psychological, physical, or financial problems that limits their success in the (re)marriage/(re)partner market. Nicely done, as usual. You imply, but do not directly state (unless I missed it), that the high post-45 marriage rate for Black women is due to an influx of marriageable men. What ages are the peak incarceration rates for males? Age 18-39? Are you suggesting that incarceration does not prevent marriage, they just postpone it by 20 years? No, I don’t think there’s an influx of men into the marriage market, although men getting out of prison is a possibility. I think it’s just that with smaller numbers it takes longer to find a match (elsewhere I showed that Black women are least likely to marry a man who matches them on age and education). Plus of course I haven’t even looked at life-course timing issues for women, which would vary by race as well. What about Asians (both east and South) and Hispanics? More precisley, why is the world black and white? If you would like to order custom analysis I am happy to provide you with my consulting rates. Isn’t it also possible that the “marriage penalty” is more sharply felt by groups lower on the socio economic spectrum, and is a particularly acute penalty for young, poor women with dependent children? It seems that the age where Black women begin to marry at greater numbers than their White peers corresponds also with peak earning years and an age where those who had children early would no longer have minor (dependent) children. To what extent might the late age of marriage for Black women be a cultural preference for living together long years before celebrating the relationship in marriage. I believe that is a pattern in Jamaica. It would be interesting to see if that pattern prevailed among Black women in the U.S. in an earlier period in the 20th century. Also future studies might have to take into account the marriage of women (and men) to each other since the availability of a pool of marriageable men won’t affect that rate. I’m curious to see if marriage equality shifts these numbers and how. Is there any data tracking on the gender of marriage partners for women? I’m not implying there’s a prepondence of queer women in the Black population compared to other races and ethnic groups. And I wonder about long term cohabitors as well.